I have a plastic sleeve that my iPad goes into that is waterproof and floats in case I drop it in the tub. I like ebooks because I don't like the clutter of having a lot of books around. I know, that's bookworm blasphemy right there. I do like to be able to share paper copies of books though. Thanks for stopping by and commenting, Heather! oh, paper books all the way! e-book is for when there is no other way I can get the book, often international titles or small press stuff that's only available electronically. when I experience reading a book, i experience it, totally. everything from how rough the paper is, to the typesetting, to how the chapter headings are done, to the bookmark telling me how far into the story I am, to the creases on the spine like the rings in a tree. 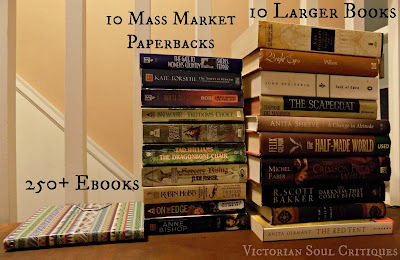 lol, my husband and I are proof that size of apartment does not limit size of book collection! Last year we moved from our tiny one bedroom apartment into a bigger two bedroom. we moved 36 boxes of books out of the old apartment. i have no idea how those even fit in there! Good for you! Somehow, living in my grandparents' house (and having only one room of my own), I amassed a collection of 400+ books- it's amazing how many you can pack away- if you get creative (I stacked vertically- it was impressive... and perhaps a tad dangerous?). I thought about the typesettings and such too, when I first got an ereader- I'm like, why isn't the font different in all these books? 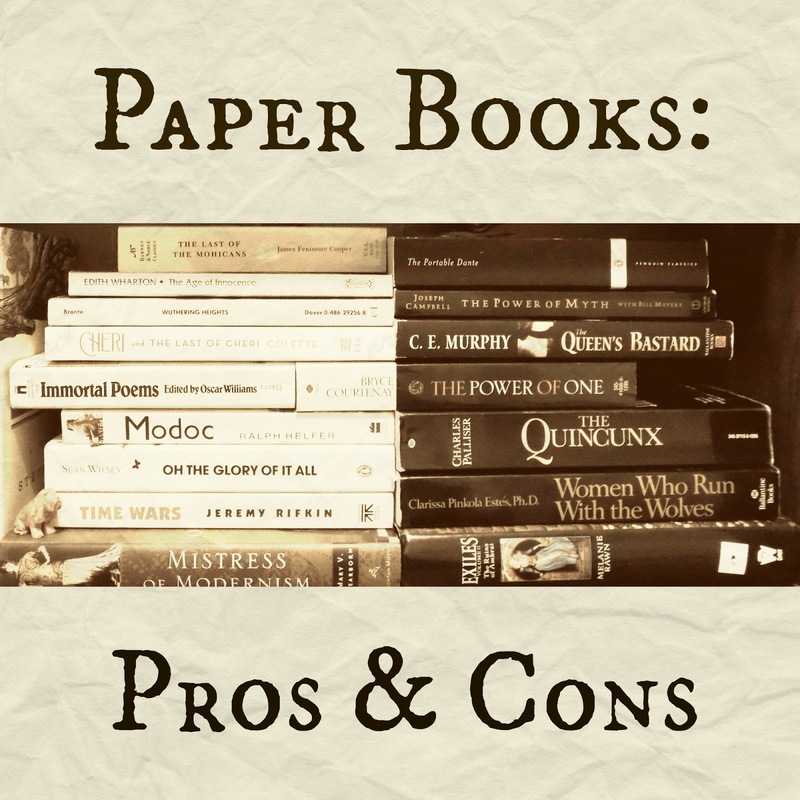 I can't really choose right now if I like paper or 'plastic', but both definitely have their perks. Thanks for stopping by and adding to the discussion, Redhead! One potential pro for ebooks is the ability to immediately look up unfamiliar words. When I'm feeling lazy, the last thing I want to do is get up from reading my book and go get on the internet or lug my Webster's Collegiate dictionary off the shelf to look something up. On the other hand, sometimes it's fun to do that. Another pro is being able to buy the next book in a series as soon as you finish the last, regardless of what time it is. That might also be a con, though, since it could lead to impulse book buying. Yes! I'd kind of forgotten about that- whenever I'm in doubt, I use my tablet to Google words and phrases, but it's so much easier to just highlight the word and- ta da! Built in dictionary. I think the insta-buy one is a wolf in sheep's clothing- for instance, I *almost* bought the entire Farseer trilogy as an ebook after I enjoyed the first one- luckily I shopped around for a few weeks before buying it. I got the next two books in the series as paper copies, for less than half I would've paid. O_o I know Amazon must get bozo bucks from that feature on the Kindles, though! Thanks for stopping by and contributing, Rachelle! 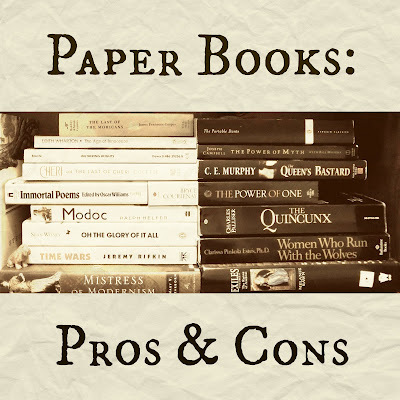 E-books definitely win for convience, but I think paper books take the win over all. 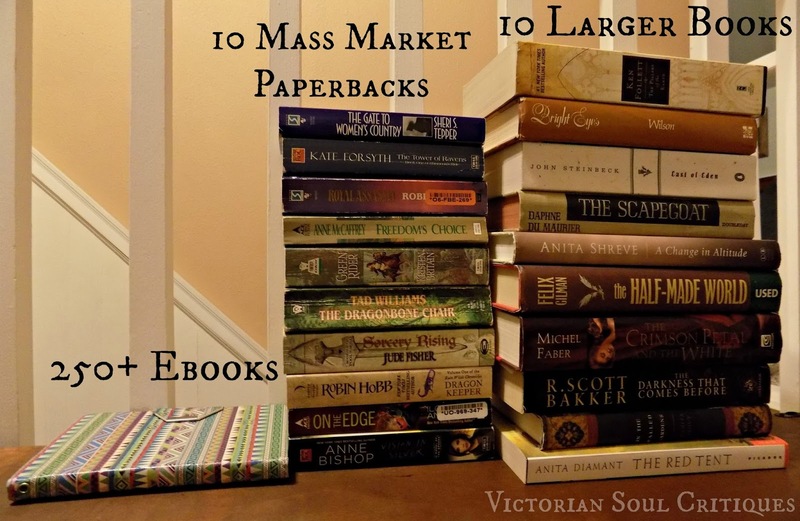 I agree, but it still depends on the person- like if you have eyesight issues, and need super big text (bigger than even large print editions can provide), it would be ebooks or audiobooks all the way. I've noticed I may need to have my sight checked, as reading paper books (with the smaller print) has really challenged me. Thanks for stopping by and giving your input, Wendy!